Your first visit to Dr. Goldwyn’s office will involve a review of your dental and medical history, an oral cancer screen and a complete examination of your mouth. Dr. Goldwyn may also need to take x-rays and models of your teeth in order to recommend the best treatment options for your periodontal needs. The next step in this initial consultation involves time with you. Dr. Goldwyn takes the time to explain his recommendations, answering any questions and addressing any concerns you might have. Together, you and Dr. Goldwyn will decide the best treatment options to reach your goals for periodontal health. From dental implants in Portland to gum grafting, we will make sure you know about all the options before moving forward. At the end of your initial consultation, the friendly and helpful staff at Portland Periodontics will provide the estimated cost regarding your personal treatment plan and assist you with determining insurance benefits, along with future appointments to begin periodontal treatment for your new, healthy smile! 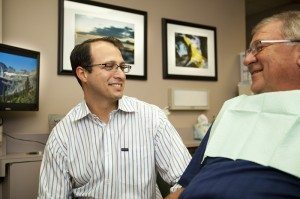 An oral examination performed by Dr. Goldwyn can help diagnose any potential problems when it comes to Oral Pathology. The inside of the mouth is generally a healthy pink color, and any changes to it can indicate a potential problem.